All transactions are safe and secure with a reliable history in online purchasing behind each of our associates. Buy the Al Bundy Football Jersey to own Married with Children clothing and merchandise. Emulate Al Bundy at the height of his life...high school! This officially licensed Polk High jersey is just like the one Al sported during his peak. 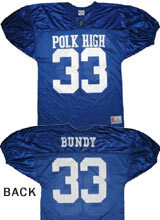 His number 33 is predominantly displayed with Polk High on the front and Bundy on the back. Be sure to include the story of Al's four touchdowns in one game to get the full effect. It's rather impressive for a now struggling women's shoe salesman. You can select a new or distressed style for this blue jersey. Be careful though, this jersey may attract a Peg wannabe that you'll have trouble shaking. Wear it overtop one of your Married with Children t-shirts. In addition to the Al Bundy Football Jersey above, browse the Married with Children Clothing Gallery for more apparel like men's and women's clothes, kids shirts or hoodies.